The Erhardkirche Church in the Nonntal area of Salzburg is a Baroque church, designed by Giovanni Gaspare Zucalli - the same architect that designed the nearby Kajetanerkirche Church. 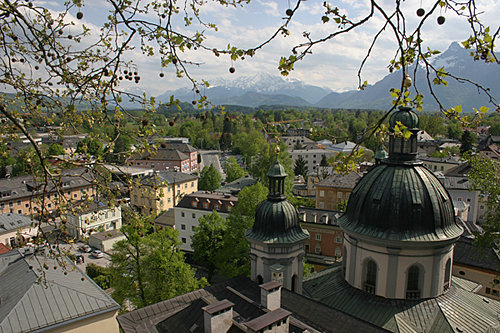 It is famous for its Baroque interiors, but also for the picturesque setting: The Erhardkirche′s cupola and towers are beautiful landmarks if viewed from the Nonnberg, the moutnain just underneath Salzburg Castle where the nunnery of Stift Nonnberg can be found. Note that a very similar photo from winter can be found in our "Salzburg in Winter" photo gallery.